We are a self serve, soft serve sundae shop with many toppings. 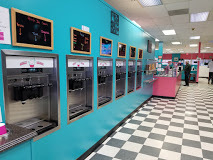 We offer a variety of frozen yogurt flavors, Perry’s premium chocolate and vanilla ice cream custard and nondairy sorbets. There are twist options as well for each pair of flavors.